It’s a novel approach to simply deny reality, but it may be the best defense in London this summer if the organizers’ and government’s mistakes continue to pile up. Motorists driving into London were stuck in a 12-mile tailback as the Games lanes came into force, but according to those in charge of the road network there was no “gridlock”. While Transport for London insisted that roads were no busier than a normal rush hour, frustrated motorists crawled into the capital. The Highways Agency also described traffic as “flowing”, which was not how it was seen by drivers who at one point were confronted by a nine-mile queue starting at the M4 Games Lane. Elsewhere traffic inched its way into London on the A4, with the queue snaking back from the Hammersmith flyover to the start of the M4 motorway. 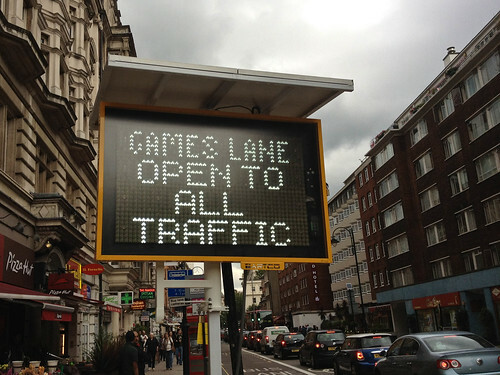 A sign announcing that VIP traffic lanes in London are open. Photo by secretlondon123. Hold-ups were also reported on the A40 around Ealing and Westway as well as the A12 at the Lea Interchange. A Transport for London appeared to play down the impact of the Games Lanes, which are reserved for members of the “Olympic Family” – officials, competitors and sponsors, with ordinary motorists facing a £130 if they use them. Police, however, said roads were running at capacity, suggesting that fears of traffic chaos were not misplaced. The introduction of what have been dubbed “Zil Lanes” has caused huge resentment among motorists and cab drivers in particular, who have threatened to stage a wave of protests. Lutfur Rahman, the Mayor of Tower Hamlets – which is bearing the brunt of the lanes, has also been critical of TfL. Justine Greening, the Transport Secretary, has tried to defuse the controversy by urging corporate sponsors to use public transport to get to and from the Games venues, rather than triggering more resentment by being swept past motorists in the “Zil Lanes”. TfL’s planners have been banking on many people deserting London for the Games which, they hope, will bring traffic levels down. Setting a target of a 30 per cent drop in normal volume, TfL has sought to encourage the use of public transport by suspending all engineering works on the underground network. It has also urged businesses to help cut the number of commuters by allowing staff to stagger their hours or to work from home. Problems were also reported on a number of tube lines, including the Metropolitan, which will carry football fans to Wembley. Elsewhere there were delays on the Central Line. Even the cable car service in east London linking Games venues on both sides of the river was suspended for more than half an hour because of a technical fault.